The 105mm LAV III Light Self-Propelled Howitzer (LSPH) is a joint project between General Dynamics Land Systems (GDLS), Denel Land Systems (DLS) and Rheinmetall Denel Munition (RDM). 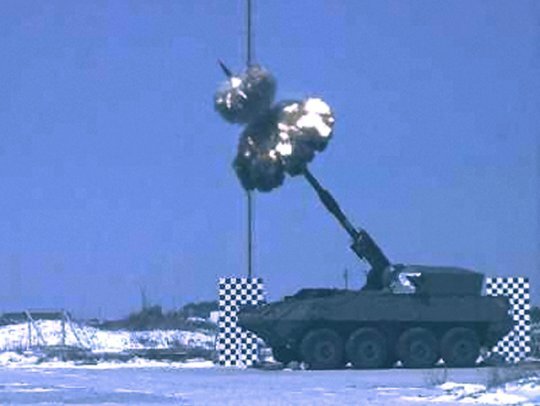 The 105 Self-Propelled (SP) Howitzer is based on the unique 105 mm Towed Gun Howitzer ballistic system as developed by Denel, packaged in an integrated and lightweight turret system. In 2003 a Teaming Agreement was made with Denel. In May 2003 a Decision was made to design and build a functional 105mm LAV III SPH as a risk mitigator and marketing demonstrator. The GD Artillery Team assembled to make it happen. Stryker Brigades used the M198, a dependable and effective cannon. But as a towed system, it did not match the survivability and mobility of the formation it supports. The M777 lightweight 155-mm cannon with towed artillery digitization (TAD) added was an interim solution. But the US Army continued to pursue a self-propelled cannon for the Stryker Brigade with a better 6400-mil capability deployable in a C-130. The NLOS-C will share the same chassis as the infantry and armor FCS variants it will support. For the first time, the guns will have the same survivability, mobility, operational maneuver and sustainability as the maneuver forces they support – that is significant. The US Army has a stated requirement for an indirect fire support capability for its Interim Stryker Brigade Combat Teams, for which the US House of Representatives passed a bill during May 2003. The House Defense Authorization Act required a report to be submitted by the Secretary of the Army to the Deputy Secretary of Defense not later than July 8, 2003, that identifies options for modifications to the equipment and configuration of the Army brigade designated as "Stryker brigades" to assure that those brigades, after incorporating such modifications, provide a higher level of combat capability and sustainability; a capability across a broader spectrum of combat operations; and a capability to be employed independently of higher-level command formations and support. The Secretary of the Army was required to include among the enhancements considered for the configuration of the fourth Stryker brigade combat team enhancement with heavy armored vehicles, with additional heavy attack helicopters, with additional reconnaissance and attack helicopters, and with indirect fire artillery capabilities, or with any combination thereof. The Stryker mortar carrier is the basic Stryker equipped with a 120mm mortar system. One of ten different variations of the Stryker, it provides indirect fire support to Soldiers in the Army's six Stryker brigade combat teams. The Stryker Mobile Gun System carries a 105mm cannon, the same gun tube as the one on the original M-1 Abrams tank. 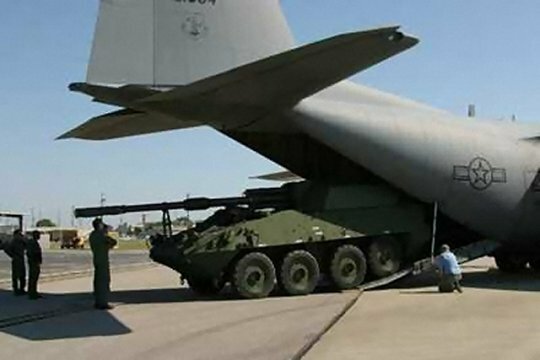 This is not a tank replacement, but it gives a direct fire capability to support the infantry elements. This program started with a teaming agreement in July 2003 with GDLS to customise the Denel Land Systems Light Experimental Ordnance (LEO) 105mm artillery ballistic system for various requirements in the USA and Canadian Armies, the USA Marine Corps, and other potential customers. 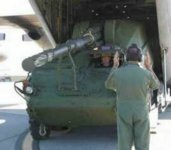 Major challenges facing the joint Denel-GDLS team were to integrate the system with the USA Inertial Navigation Unit and its Towed Artillery Digitised Fire Control System. In October 2004 General Dynamics Land Systems signed a teaming agreement with Denel of South Africa to jointly customize and market more lethal, long-range and lightweight 105-mm artillery systems for domestic and international customers. Denel is the world leader in the development of long-range artillery systems. General Dynamics Land Systems is the defense industry's largest system developer, integrator and manufacturer of ground combat armored military vehicles. The company designs and builds armored vehicles and systems worldwide. Denel Land Systems Lyttelton built a turret around its 105mm LEO system which was integrated on the GDLS LAV-III vehicle in Canada during February 2004. The system was then formally launched at the AUSA Conference in Fort Lauderdale, Florida in March 2004 and subsequently tested at a facility on the Eglin Air Force Base, USA. 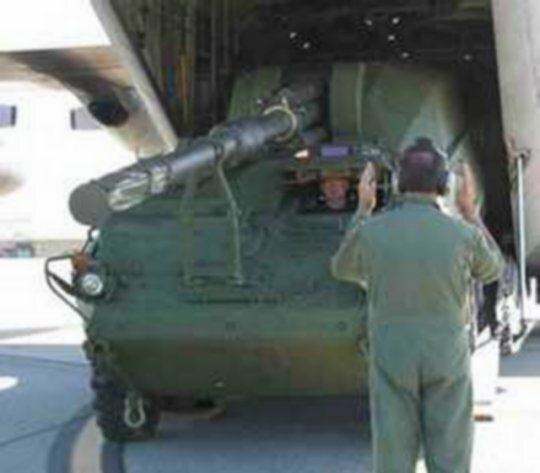 After a demonstration at the US Army Field Artillery Centre at Fort Sill in April 2004, the system was exhibited at several exhibitions and conferences in the USA and Canada. Denel's newly developed Uni-Modular artillery Charge System for 105mm guns proved equally successful during the Fort Sill demonstration. At the same time, Denel's 105mm Pre-formed Fragmentation projectile was also subjected to a comparative test with natural fragmentation ammunition. Although non-US military personnel were not allowed to be present at this arena test, the results were most impressive, according to unofficial information. It would seem that Denel's pre-formed fragmentation ammunition showed its terminal effect to be two and a half times that of the natural fragmentation ammunition. At a demonstration in the United States in November 2005 Denel scored high with its 105mm light artillery ammunition and turret mounted on the LAV III (Stryker) vehicle built by US company General Dynamics Land Systems (GDLS). Most senior US Artillery decision makers, including Maj Gen M Ralston, new Commandant of the US Army Field Artillery Center, attended the demonstration held at the Fort Sill Military Base in the USA on 15 and 16 November 2005. With this demonstration Denel and GDLS proved the success of the prototype Self Propelled (SP) 105mm artillery system and Denel's pre-formed fragmentation ammunition. The development the 105mm LAV III Light Self-Propelled Howitzer (LSPH) took another leap forward with the certification in July 2011 of the system as safe for manned firing tests. To date, the system had been remotely fired. Work on the development resumed in 2010 after the cancellation of the US Army’s NLOS-C (non-line-of-sight, i.e indirect fire, cannon) program the year before. DLS in a statement said the LSPH during the week of 04 July 2011 fired high explosive projectiles at a maximum range of 31km from a manned turret at Armscor’s Alkantpan Test range in the Northern Cape. “This marks a significant advance in maturing the technology of this revolutionary artillery system,” the statement added of the weapon that has the logistic footprint of a 105mm howitzer but the range and terminal performance of a 155mm system, “but with better precision”. T7 development stalled when the US Army decided to equip its Stryker brigade combat teams with the M777 155mm towed gun.